Lurcio is a much-put-upon slave in the ancient Roman town of Pompeii. More often than not, Lurcio finds himself keeping his owner's family members apart, in order to keep them together. Bob Hoskins ... Recruiting Sgt. Vincento: [drunkenly] I will take your breath away. Lurk: [recoiling] I wish you'd take yours away! 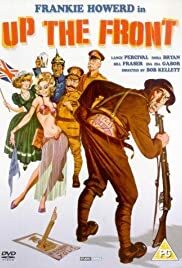 During a series of unlikely misadventures, a First World War army recruit (Frankie Howerd) ends up with vital military information tattooed on his backside, and he struggles through enemy territory in a desperate attempt to reach the British forces. The third and least effective of the theatrical features inspired by TV's "Up Pompeii!" (1969-70), starring camp British comic Howerd, whose penchant for gossipy asides to camera was well-served by the first two films (UP POMPEII and UP THE CHASTITY BELT, both produced in 1971). However, whereas "...Pompeii" and "...Chastity Belt" loaned themselves to Howerd's brand of comedy by virtue of their colorful locations (ancient Rome and Medieval England, respectively), UP THE FRONT is scuttled by its resolutely unsexy wartime setting, which sits uneasily alongside the 'Carry On'-style bawdiness of Howerd's trademark humor. As a consequence, despite the star's best efforts (and a screenplay co-written by Eddie Braben, the celebrated scriptwriter for Eric Morecambe and Ernie Wise, arguably the finest comedy double act in UK TV history), the movie falls decidedly flat. Bob Kellett directs with the same faceless efficiency that distinguished the first two movies, and Howerd is ably supported by guest stars Hermione Baddeley, Stanley Holloway and Zsa Zsa Gabor (as Mata Hari! ), sharing screen space alongside Bill Fraser, Lance Percival, Madeline Smith, Peter Bull, Vernon Dobtcheff and many other familiar faces. Co-star Dora Bryan sings the jolly theme song, and there's a blink-and-you'll-miss-it cameo from young Bob Hoskins! Despite the movie's many failings, Howerd makes the most of some riotous double entendres (his scene with Gabor is a delight, reworked from a similar routine in one of the best TV episodes of "Up Pompeii! "), and the pace remains busy throughout. The real star of the show, however, is art director Seamus Flannery (REPULSION, THE WICKER MAN, FLY AWAY HOME), who works miracles on a microscopic budget, from the vivid colors of Gabor's boudoir to the war-ravaged landscape of No Man's Land and the main square of an occupied French village. If nothing else, the movie is a visual treat! Unlike its predecessors, the movie wasn't a popular success, and Howerd - who favored stage work over any other medium - made only sporadic film appearances from this point onward, most notably THE HOUSE IN NIGHTMARE PARK (1973), an odd blend of comedy and horror, and SGT. PEPPER'S LONELY HEARTS CLUB BAND (1978). At the time of his death in 1992, he was slated to appear in the unhappy CARRY ON COLUMBUS, which opened later the same year.